"On A Golden Horizon" is out! The follow-up to my last album "Hibernation" is now available! For the time being you can go check it out at SoundCloud, where every track can be streamed right away or downloaded if you prefer to have the MP3s. I'll be uploading a ZIP-file with all the MP3s together with a playlist + front- and back sleeves eventually, so have a look in the music section later if that fancies you. 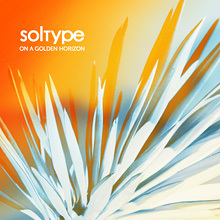 Listen to "On A Golden Horizon"
It's been nearly two years since I released any new Soltype materal, so the time has finally come to unveil my latest project. The new album, titled "On A Golden Horizon" is something of a change for me musically. I wanted to explore different territory, and try making music not only with the computer, but actually holding an instrument in my hands. It's still very much an electronic album, but the idea is to try to get away from the often cold feeling of my previous releases and create an uplifting sound. You'll get to hear the entire thing on February 24th 28th, but in the meantime, here's a little taste of what to expect. Hope you like it! Listen to the preview track "Higher Ground"
As this year draws closer to its end, I thought it would be a good time to write a little about current projects. "Mega Man 10: The Unofficial Arrange Soundtrack" is slowly moving forward and it looks like I'm finally going to have it completed very early next year. In the meantime you can check out the album cover to the right. I'm also glad to say that my other album project is almost done. Most of the tracks are done, but I'm trying to polish them just a little bit more. 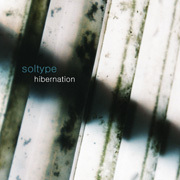 The tone will be different from the previous one, "Hibernation". I'm going for a slightly warmer, dare I say, more "positive" sound. One way of achieving this is incorporating more traditional, or "analogue" instruments, such as guitar and piano. And there's my final post for this year, hope you all have a nice New Years Eve! Forgive my absence the last two months, I haven't felt like I've had anything good to post on the site. 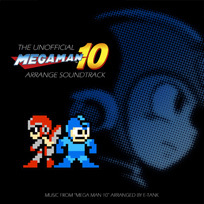 Plus, I've been busy on my massive project "Mega Man 10: Unofficial Arrange Soundtrack" (I'll see if I can come up with a slightly catchier title :P). Yes, I am making arranged versions of almost every song from Mega Man 10. Once I'm done you'll be able to download the entire album here, free of course! ...Oh right, the update! Well, there's a whole bunch of new photos in the photography section now, so be sure to check those out. I've changed the layout slightly so that the pictures can be sorted into albums now, which mean less scrolling for you :) And that concludes this update, see you next time! As a continued celebration of Mega Man 10's imminent release, I've prepared yet another arranged song. This time it's from the somewhat obscure game "Mega Man & Bass". This game was originally released for Super Famicom in Japan only and takes many elements from Mega Man 8 on the Playstation. However, the soundtrack is very different from that game. Instead, you're treated to stylish jazz vibes much like Street Fighter Alpha did. It's no wonder, really, seeing how Capcom's music composers seemed to be swept up in a jazz phase at the time. Anyway, this time I have two new tracks to offer, one from Castlevania: The Adventure and another from Mega Man 10. Yeah, I'm getting WAY ahead of things here aren't I? 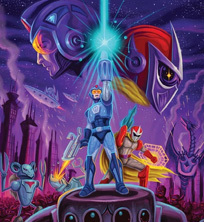 Mega Man 10 will be released in March but there's already plenty of material out there for fans to be creative with. Christmas is just around the corner and this'll probably be my last update for the year, so in the spirit of the season, here are two new arrangements for you. First one is "In The Wind" from the Gradius III soundtrack, one of the best, most energetic Shmup soundtracks from the 16-bit era. The second one is also from a 16-bit classic, none other than Sonic The Hedgehog. Doing an arrangement of the Spring Yard Zone music wasn't an obvious choice at first, but the more I listened to it, the more I wanted to do it. Speaking of Sonic music, did you know about the rumor that Michael Jackson was originally signed on to compose music for Sonic 3? The speculations have been going on for years, and though it's been said that his tracks were never actually used, it's hard not to notice some similarity between Sonic 3's music and Michael's album "Dangerous". This video will explain it all better than I can. I'll try snapping some new pictures soon as well. After all, autumn is in full effect and there's bound to be some nice things to capture. By the way, I'd like to recommend Air's new album "Love 2" which should be out now if I'm not mistaken. If you have Spotify installed you can listen to it right now here. So without further ado I say bye for now, be sure to check out the songs, especially if you like Contra. Time for a big update today! Lots of new things are happening on the site. First off, something really nice! All my old music releases (dating back to 2003 and forward) from my various aliases are now available to download or stream, thanks to Last.fm. Go ahead and check them out! I got a mail from a Joram Nowak a couple of months ago asking if I was going to do any more Mega Man 3 arrangements. Well then, Joram, I hope you enjoy my take on the Spark Man theme! You can listen to it in the now renamed page arranged music (to separate it from my original music). It's more techno-ish than what I've done before, but I thought it suited the song. I've also added a brand new photography page, which I'll try to keep updated with a fresh batch of pictures every now and then. You view the pictures through a nifty little lightbox-inspired interface, which has also been incorporated into the illustrations gallery. That pretty much sums it up I guess. Hope you're all having a great summer! The illustrations gallery has finally been opened, with a rather modest number of pictures available at the moment, but I'm working on that :) There's also a new game music arrangement, which fans of Mega Man might enjoy! You may also notice the slightly different look on the site. I wasn't too happy with the artwork and colors so I changed it slightly, hopefully for the better! Just a quick heads-up here. I will be releasing a brand new album this Friday, free for download at last.fm! It's the first thing I've released since 2006, so you could say it's long overdue :) It took me a long time to come up with a good amount of tracks that I felt satisfied with, and I've spent many nights frustrated with creative blocks. But now it's almost here! New music up for grabs! I've been busy working on some new tracks for you guys. Head on over to the arranged music page and check out the two songs at the top, "Super Mario Theme on DS" and "Tower Of The Serpents", a remake of Snake Man's song from Mega Man 3. I recently picked up a cable that allows me to get audio directly from my Nintendo DS through its microphone jack, which comes in handy for recording stuff made in Korg DS-10, a neat little program that basically works like a scaled down music sequencer. All you have is two synthesizers and a drum sequencer, that's it. While this might seem like a frustrating limitation at first, it's actually quite fun forcing yourself to work with what you've got. For instance, in "Super Mario Theme on DS" I overcame the problem of only having two synths by using a percussive drum sound to add an extra layer of melody. That's it for this time, enjoy the tracks! I feel a little stupid about it, because I registered this domain a long time ago and the place has pretty much been untouched. But that's going to change now! So what can you hope to see on this site in the near future? Well, I've got plently of music waiting to be heared, both new and quite old. Expect to find a lot of arrangements of classic video game music as well, as I enjoy recreating songs in the way I think they'd sound had the original music ever been made with modern equipment. I wish I could write more right now, but to be honest I'm not good with writing lengthy paragraphs about recent stuff. So anyway, keep your eyes peeled for more content soon!